The wet fish shop on Amble’s Queen Street has had a makeover and a takeover – albeit within the same family. Previously run as J&J Seafoods, the shop has had a dramatic makeover, with a feature wall catching the eye as you walk in. A chilled display of fresh seafood salads is followed by a large counter filled to the brim with locally sourced sea fayre. 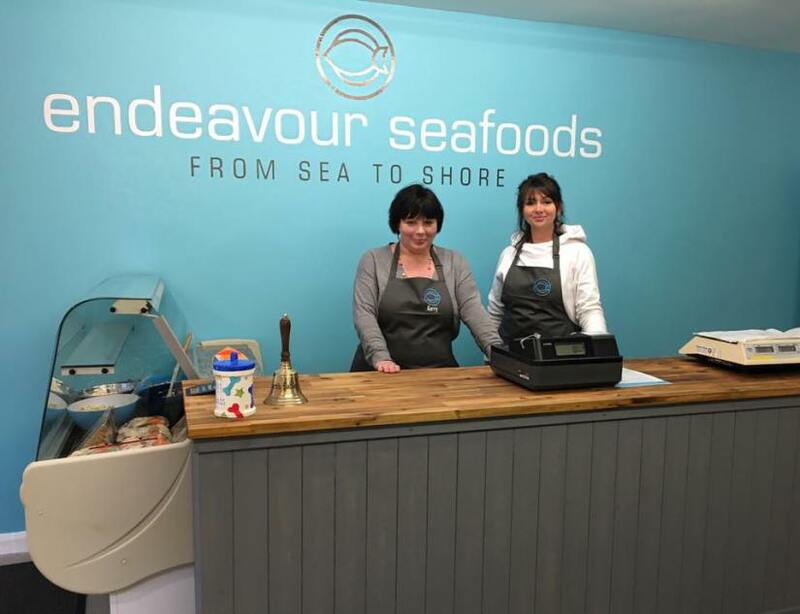 Sisters-in-law Kerry and Alane Bould have taken over the running of the newly renamed Endeavour Seafoods shop, while their husbands, fishermen Richard and Michael Bould continue to provide the crabs and lobsters from their boats Bold Endeavour and Bold Coquet. All the produce is locally sourced, the white fish is from the North Sea and North Atlantic, other fish is obtained from North Shields fish market, while smoked fish comes from Craster. As ever when there is fish involved, bureaucracy is not far behind. Despite being married to Amble fishermen, Aline and Kerry must still apply for a licence to buy fish directly from the Amble fleet. The shop is open from Tuesday to Saturday. Customers are encouraged to come in and browse the counters and shelves, and the shop is dog-friendly, with a jar of complementary treats and sprats on the counter – although the latter appears to be an acquired taste. To add to the produce on display the shop sells a range of sauces, dressings and drinks. For prices and opening times see their website: www. endeavourseafoods.com The shop is also on Facebook. One thought on "Fish shop continues in the family"
Good Luck in your new venture, I hope you have lots of customers that go out and let their friends know how good your produce is.